Hello! I shall do a proper introduction post soon, but I didn't want it to get too far into November without me posting the full extent of my "Joan" costume. My costume consisted of my mom's vintage fur coat, her Christian Dior lipstick, my everyday black stockings and flats, a $5 dress from a vintage shop in Manhattan (who would've thought?!) + tailoring, and a broach and wig from Monk Vintage in Park Slope. I ended up putting a key on a gold chain instead of using the pearls. The tailoring was a bit of a cutting-it-close kind of moment. 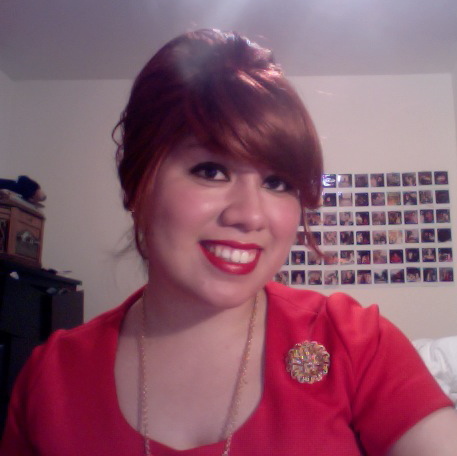 I had a "back up" 60's dress, but I wanted red since that's usually what you think of Joan in. I took the dress early in the week, but picked it up day of the party. It was too tight. I told the tailor "This is saying "Club Miami" much more than it's saying "Saucy Secretary." He was a miracle worker and I got the dress just a few hours before I headed to Mondoween (aka my favorite indie pop dance night + Halloween fun).